Tater Tot Eggs Benedict consist of poached eggs drizzled with Hollandaise sauce on a crispy bed of tater tots with slivers of Canadian bacon. 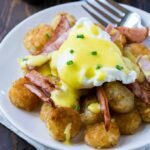 I’m in love with eating Eggs Benedict this way and if tater tots are your jam, you will be too! Eggs Benedict is the ultimate savory breakfast dish. As much as I love the original, it’s also fun to try variations like this Southern-Style Eggs Benedict with pulled pork on a biscuit. Regular Eggs Benedict is almost a let down after enjoying these Tater Tot Eggs Benedict. I mean, how can a lowly English muffin compete with tater tots crisped to perfection? Homemade Hollandaise sauce is kind of a pain to make and you could use one of those mix packets to make it, but the real thing is so much better. This recipe for Hollandaise sauce just takes a little patience. You want to keep the heat low so you don’t scramble the eggs. Your forearms will get a workout stirring! But ultimately you will be rewarded with one of the most delicious breakfasts ever! 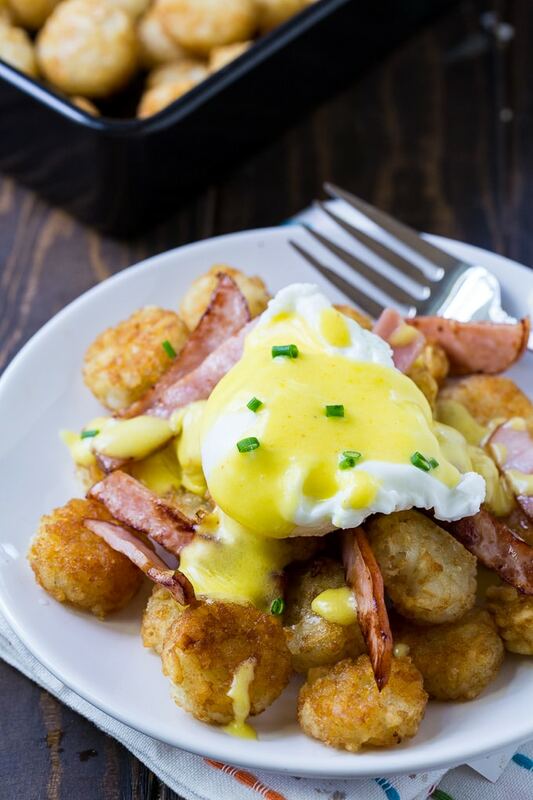 Tater Tot Eggs Benedict consist of poached eggs drizzled with Hollandaise sauce on a crispy bed of tater tots with slivers of Canadian bacon. 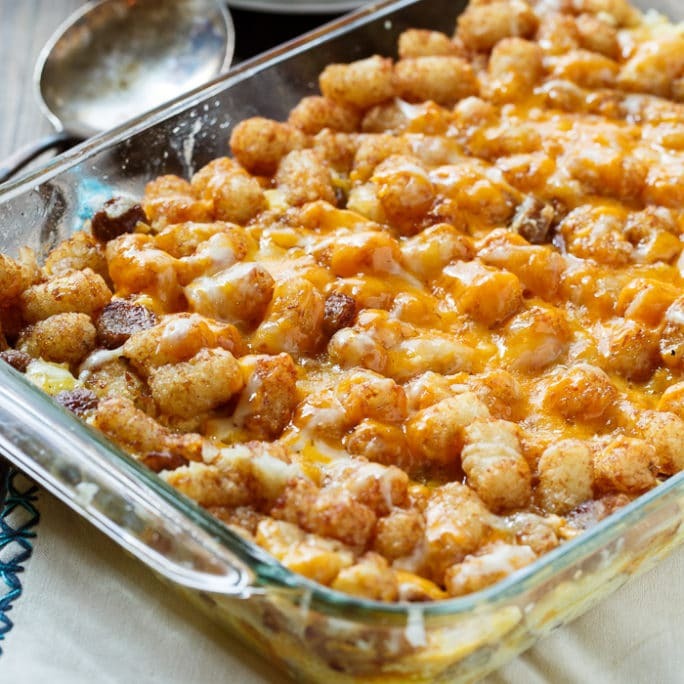 Cook tater tots according to package directions. 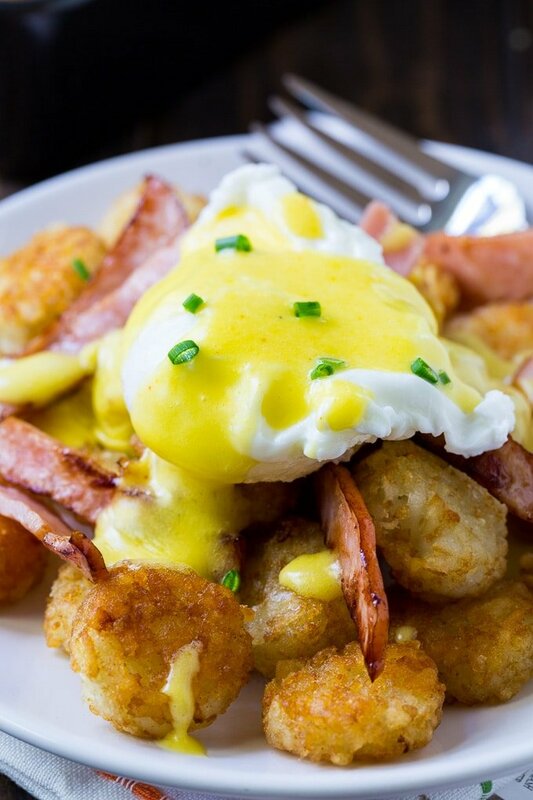 While tater tots are cooking, make hollandaise sauce. In a stainless steel bowl whisk the egg yolks and lemon juice until thickened and doubled in volume. Place the bowl over a saucepan of barely simmering water. Make sure the water does not touch the bottom of the bowl. If the eggs get too hot they will scramble. Very slowly drizzle the melted butter in while continuously whisking. (It's a good idea to lift the bowl up every minute or so to make sure it is not getting to hot.) When all the butter has been added and the sauce is thickened and doubled in volume, remove from the heat and whisk in cayenne and salt. Keep warm until ready to serve. If sauce gets too thick before serving, add a little warm water. You will know it is done when you run a whisk through it and you can see the pan bottom. Cut Canadian bacon into thin strips and cook in a lightly greased nonstick pan until lightly browned. Fill a sauté pan with a couple inches of water and bring to a simmer. Add vinegar. Crack eggs one at a time into a teacup or small bowl. Slowly lower teacup into water and slide egg into water. You can use a spoon to push the egg whites closer to the center of the egg. Let eggs poach for 3 to 3 1/2 minutes and remove with a slotted spoon to a paper towel lined plate. Season to taste with salt and pepper. For each plate, place about 1 1/2 cups tater tots on plate and top with 1/4 of the canadian bacon and 2 poached eggs. Drizzle with Hollandaise sauce. 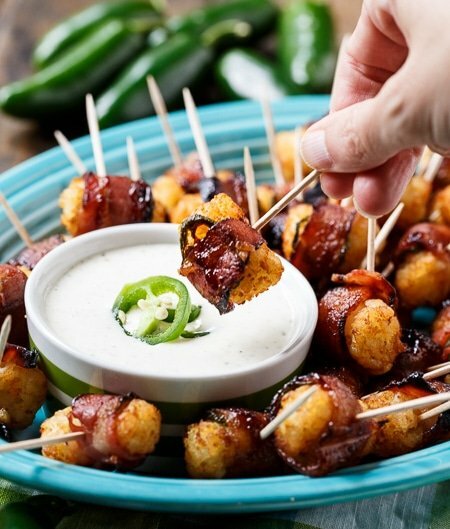 This entry was posted in Breakfast and tagged eggs benedict, tater tots. Bookmark the permalink.